Oh No! How Do I Respond? It’s time to change our dialog. We’ve been asking these questions for way too long. I used to be shocked by the responses, but not so much anymore after years of hearing one of the three common responses. The methods used by the vast majority of the dentists that reach out for my help, and from the job applicants that I interview almost always hear one of the three a combination of the three or even every one of the three following questions. I MUST change this dialog that has gone on way too long and I will break it down as to why. The salary is initially determined based upon: 1) what the job candidate asked for, 2) what they said that they needed, or 3) what they made in their last position. Some people work for the love of it. They are totally supported financially by their partner, significant other or spouse and are not necessarily working because they “need” the money. They enjoy what they do and simply want to be paid fairly so that they can stay with what they enjoy. They certainly need to be paid minimum wage to keep things legal within government guidelines. So does this mean that even if they are awesome, prove to be an exemplary employee, keep your bottom line up based on their personal contributions, etc., that you can pay them minimum wage? How long do you think this person will work below their value? What if they are clearly a very valued, hardworking team member who proves themselves every day? You probably know they are underpaid, but if they don’t bring it up, neither do you. Sound familiar? What if they ask for a number that’s either fair or slightly over the market because they have a lot of expenses, bought a new car, drive a long way, are a single parent, etc.? Granted, we are all caregivers and want to help however we can, but what if they turn out to be a less than adequate employee, one who takes off often, doesn’t pull their weight, and proves to be an ineffective employee? You’ve paid them based on their personal needs; and as a result they are not delivering anywhere near the value that would justify their compensation. This team member can be a huge drain on the team and your budget. What about basing it on what they made in their last job? So their last job was a complicated one with lots of responsibilities and more than would be expected of them in your practice. They did an amazing job and were appreciated by their last employer. They were with the practice for 15 years and subsequently received earned increases based on performance and worth. They came from a market that had a high cost of living, so salaries were considerably higher than they are in your market and their salary reflected this as well. So, you asked them what they made previously and they told you, so you hired them at the wage they quoted you. After a few days you notice you can’t sleep or eat worrying about the high dollars that this one employee is being paid, so within a week or so you have to dismiss them. Now this individual could have been a great employee for you in every way, but you suffered from buyer’s remorse and never gave them the time to learn your office systems, etc., and prove themselves. They could very well have been as great for you and your practice as they were for their previous employer, but they never had the opportunity or guidance to meet the goals of the position in your practice. They also could have been happy with the salary that made sense for your market, the position they applied for, etc. Nonetheless, the dollar signs swirling around in your head cause you to dismiss her and seek her replacement. Not only are you back to your (costly) search again, but the employee is back in the job market wasting time and possibly putting an unnecessary “blemish” on her resume. What good was this investment of time and energy for either of you, simply because you asked the stunningly insignificant question, “What did you make in your last job”? What about what they want to make? This is obviously a loaded question, and by rights, is an opportunity to throw out a number that they would like to make and not necessarily deserve to make based on their skill sets, experience, temperament, and ability to contribute to the success of the practice. Here again, you asked them and they told you. What I see here really troubles me. You hire them at a rate based on what they “wanted”, which you find over time is not what they deserve. Soon enough, you figure this out and so does your team. Another example of the futility of asking this question is that often a job candidate will come up with a number that they know is quite low based on their talent and experience, but they desperately want the job, and throw out a number well below your market. So you hire them at a rate that is well below their ability level. The outcome here would be somewhat similar to the applicant that was paid what they made in their last position, except that the new team member will eventually become disenchanted and demotivated since they are truly underpaid. I do hope that you keep all salary assignments totally private. No one on the team should know what anyone else is earning, and yes, I believe the only person aware of team salaries should be the doctor(s). I know this is a rare occurrence for most, but nonetheless I feel strongly for many reasons that this should always be the case. Have I piqued your interest in this subject? There are a number of things that can be done to change the way we assign compensation and safeguard the possibility of being confronted with the situations I discussed in this post. Over the many years of encountering these scenarios, I have figured out a number of things that will reverse the way this area of dental hire has been handled since the beginning of time. I’ve had amazing success with job candidates, doctors and team members utilizing protocols that make sense and are fair for all. Watch for part two where I will offer some road-tested solutions. For those of you familiar with DiSC–or even better–have been exposed to my own S E L F Profile Assessments that relate directly to the dental industry, I made a very interesting observation on the tennis court with my husband, Russ the other day. Russ is an unusual combination of “S” “L” which is equivalent to the “C” “D” in DiSC. I am a Structured Caregiver while he is an Organized Driver. His behavior, as does everyone’s, shows up all the time in day-to-day activities and interaction. For example, when we are escorted to our seats in a restaurant I have him pick the table and where we sit. For me it’s easier to make him happy, and I truly don’t care. Today on the tennis court he got impatient waiting for me to get back after retrieving some balls. He was so anxious and VERY ready to start playing that he served without looking across the court to notice that I wasn’t ready. With my head down I was moving into position as the ball bounced into the serving box and then hit me in the head with some force. 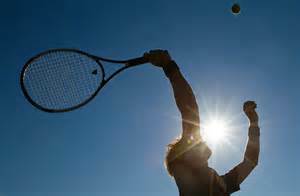 Understand that I love to play and make sure he is never easy on me, so the ball was served to me without easing–up hitting it with some force as a strong tennis player would. I enjoy trying to get them back and many times I do, but he is clearly a much stronger player than I. What upset me so much was that he couldn’t stop long enough to see that I wasn’t ready to accept the serve. He apologized of course, but from that moment I began to play like I have never played before. I started to smack the balls as hard as I could and they were all going in. I actually had him running and missing many of my shots. It was as though I was possessed, channeling my Serena Williams. This brought out a side of me that I never saw before and Russ was amazed too! What’s interesting about this is that it was such a change from my normal demeanor that I found I could only hold out for 2 games and then resorted back to my comfort zone. It wasn’t due to fatigue. It was due to a behavioral style that was not at all familiar to me. This is what I coach all the time regarding how our behavioral makeup can be adjusted only to a certain degree, and we will inevitably return to the style that with which we identify. We can make small changes in how we accomplish things, yet changing our behaviorial style completely is something that really can’t be done. What I did learn is that I do have it in me if/when I want to get a little aggressive–at least on the tennis court. Last week I had the opportunity to present to teams and dentists from Northern California. I’ve spoken to hundreds of teams and doctors over the years and one common thread seems to ring true for all of them. Once a new concept, format, system or idea is presented, no matter how engaged or excited the group is to hear what it is that you are going to share, the energy and sometimes the laughter begins to subside. I find this interesting in that the majority of the audience will lean forward in their seats, hanging on every word, and yet when asked, “Do you have any feedback or questions regarding these new ideas?”, they tend to fall silent almost as if they are trying hard to absorb some very new ways of handling some very old routines. Typically, after my presentation a number of them will approach me privately and ask some additional questions or ask for more information on my topics and subject matter; or in some cases they ask if they can email me or call. Of course I am always open to share and converse with them if they would rather not address their questions in front of the group, but more and more I’m beginning to understand and realize why it is that they tend to freeze up during my programs (and probably many of yours too); in particular those speakers that are presenting and discussing a major change within the normal day-to-day operations of the average dental practice. Advancements in technology and science is something that doesn’t seem to intimidate many people, as they are current with all the new state-of-the-art materials and equipment. It appears to be the changes in systems and protocols that take a little longer for some to buy into and feel comfortable enough to welcome change. My focus and specialty is team hire, development, integration and maintenance, which from my observations nationwide have not been significantly changed or improved in, well…I’m going to say at least 50 years. So many paradigm shifts need to be made that I believe are urgent for the health of our industry. 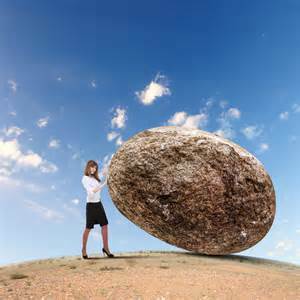 My goal is to continue to push my boulder up the hill and encourage doctors and their teams to make adjustments to the archaic procedures used in dental team development. Change is so overdue in this area, considering that we have progressed and come so far in the technical aspects of our business. What is amazing to me is that “The Team”–the segment of our business that truly drives the business–continues to be managed with the same minimal systems, void of structure, entering into the hiring process with no plans in place, no clear idea as to exactly the person they are seeking and no idea what or how they will be paid. I am happy to report that there were many “ah-ha” moments for the group I spoke with last week. A number of team members and dentists seemed to get it and they were excited and anxious to make the changes! There are always a number of positive reactions even though I would be elated to receive 100%! If I can modernize even one of these antiquated methods that have been kicked around for all these years I will be one happy girl!